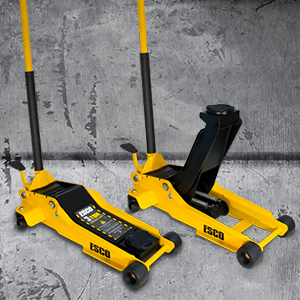 ESCO (Equipment Supply Company) is pleased to announce the new Pro Series Trolley Jacks by ESCO. Available in 2 Ton and 3 Ton Lifting Capacities these new jacks are loaded with unique safety and functionality features that make them second to none for any professional garage or car enthusiast. Features of this jack include a “Double Pump” design that not only raises the jack much quicker by utilizing the foot pedal lifting system but provides a much safer and more controlled lowering of the jack under load. The “Lift & Twist” controlled lowering system uses a Two-Speed Action Release that allows for the user to lower the vehicle with absolute precision or quickly lower the jack with no load present. Other features include a built in “Tools & Parts Tray” for convenience in storing parts/ tools and strong nylon wheels that will withstand constant use and not damage finished shop floors. The 2 Ton version [Model #90520] is also one of the lowest profile jacks in the market at 2.95”. Jacks also include Padded Handle for protecting vehicle finish from damage while jack is in use. The Pro Series Trolley Jacks [Model #90520] & [Model #90521] are available now wherever ESCO products are sold. For more information about this product and where to buy ESCO products email sales@esco.net or call 1-800-352-9852 or visit www.esco.net and search “Pro Series Trolley Jacks”.